Shakari of the Zero Hour Legion is lost in some kind of limbo though she senses impending freedom for her Legion. Meanwhile, on the Sorcerer's World, Mysa (the White Witch) is shackled in a dungeon by the Legion villain Mordru. Her powers enable her to see her sister, Dream Girl, in the other versions of the Legion. She also sees Saturn Queen and Superboy-Prime. The Time Trapper prevents Mysa from seeing the future anymore. Blok, Wildfire, and Dawnstar break into Mysa's dungeon and free her. Green Lantern Rond Vidar helps the Legion battle Mordru. Mordru uses his magic to raise the dead to fight for him. Suddenly, Superboy-Prime and his Legion of Super-Villains join the fight. GL's ring urges him to fall back. Superboy-Prime negotiates with Mordru to join their team of Legion-haters. Back in 31st Century Metropolis, Superman argues with Lightning Lad. Supes believes they can help Prime grow a conscience so he'll turn himself in. Lightning Lad and others argue that they should kill Prime. Cosmic Boy turns on Lightning Lad - the Legion doesn't kill ever. On Sorcerer World, Mysa is able to generate a stargate to escape. GL says he's staying behind to stall the bad guys so they can all escape. The stargate closes and GL is trapped on the Sorcerer World with scores of villains. Back in Metropolis the heroes continue to fight. Founding Legionnaire Cosmic Boy tells Lightning Lad that the reason he takes charge of the Legion is so that the other two founders, Lightning Lad and Saturn Girl, can have a normal life. Brainiac 5 senses the return of the Legionnaires from Sorcerer World. GL fights alone against the Legion of Super-Villains. The heroes can't reopen the stargate. GL is about to be killed by Prime when Saturn Queen tells Superboy-Prime that GL is the son of Universo, one of the villains. Universo says all he wants is the ring. Superboy-Prime kills the last GL. The ring zooms away in search of a replacement before Universo and the others can grab it. The ring can't find a sentient replacement so it powers down and returns to Oa, where it's grabbed by an unseen hand and thrown into a pile of other powered-down GL rings. The villains argue and form a temporary alliance. As with all Prime's Legionnaires, he burns an "S" into Mordru's skin, their twisted version of the Legion flight ring. The heroes in Metropolis realize GL is dead and that all their villains have combined. Brainiac 5 pulls out the lightning rod that brought Lightning Lad back from the dead when they were teenagers and, more recently, returned Wally West and his family to New Earth. Phantom Girl, Shakari, and Brainiac 5 go to Happy Harbor, Rhode Island, the first home-base of the Justice League of America. They find what Brainy's looking for: a sphere made of the "crystallized nexus of all Earths from all parallel universes." Dawnstar, Polar Boy, and Wildfire - on Brainiac 5's instructions - break into the Time Institute and borrow a time bubble to go to the 21st Century on a secret mission that Brainy's keeping from Superman. Superman and the Legion are about to face off against Superboy-Prime and his Legion. At the same time, Mysa, using the sphere, summons the Legions of two other Earths to their Earth - the Zero Hour Legion, and the Waid/Shooter Legion. Brainiac 5 of the original Legion talks to the mass of Legionnaires from three worlds. The Waid/Shooter Legion's Brainiac 5 is reticent to listen to an adult Brainiac 5 as that Legion is distrusting of adults. As the fight over Metropolis continues, Sun Boy sits in the dark and drinks. Superboy-Prime tells Superman he intends to co-op the "S" logo and that Smallville, Metropolis, and the Fortress will be the three points of the "S" he intends to burn into the Earth itself. Meanwhile, M'onel and Shadow Lass arrive at the darkened Oa. They deliver Rond Vidar's body. A voice from the shadows tells them to leave the body and get off Oa. They beg for help. M'onel tells the shadowy stranger that they are both from Daxam. Green energy suddenly lights up around them as the voice reveals himself to be former Ion and Green Lantern Sodam Yat who identifies himself as the last of the Guardians of the universe. Story - 4: This series has officially become a more difficult book to follow with this issue. There are doppelgangers aplenty and, as if the three Legions of Super-Heroes aren't enough, several members of the Legion of Super-Villains also resemble certain Legionnaires. Nonetheless, you still don't need to be a Legion expert to enjoy the book. That's mainly due to Geoff Johns keeping the overall plot relatively simple. Essentially, Superboy-Prime assembles all the Legion's bad guys including the Fatal Five, Mordru, and the xenophobic Justice League of Earth into his own Legion of Super-Villains. The Legion has to stop him. They summon the Legions of two parallel Earths to help. Simple enough, right? Would Superman really want to reboot Superboy-Prime's conscience after Prime killed his and Luthor's love-clone, Kon-El, a.k.a. Superboy? Well yes, he probably would. Superman believes in the ultimate good in every life form. Back before the John Byrne years, Superman didn't just want to capture Lex Luthor but he wanted to reform his old friend from Smallville. The best example of this is in the Elliott S! Maggin novel "Superman: Miracle Monday". After defeating the Devil who had possessed Kristin Wells, a time traveler from the future, he gets to ask Kristin only one question about his future before she returns home, and this is the question he chose: Do he and Lex ever become friends again? Like the pre-Crisis Lex Luthor, Superboy-Prime may be a killer now but Superman's seen the good in him and refuses to believe that goodness, when it exists, can ever be extinguished. Is Superman being naïve? Maybe. But I think it shows how Superman is a super man for his brain as well as his brawn. Superboy-Prime is unbridled power without the Man of Steel's morality - or is he? Prime was a true hero in the "Crisis on Infinite Earths" and, in exchange, he lost his family and friends, his entire planet, and was locked in limbo with Alex Luthor, the Earth-2 Superman, and the Earth-2 Lois Kent. Superman may see a villain when he looks at Superboy-Prime but he also sees justifiable anger -- albeit being taken out in an unjustified manner -- and probably a bit of himself in the lad too. Superman also knows that Superboy-Prime on his own came close to destroying Earth and the super-heroes of the 21st Century. Superman has to be thinking that the Legion won't get through this fight without casualties, and death on either side is simply not an option. Art - 5: I don't think there's any other comic book artist than the legendary George Perez who could have drawn this issue. Nobody does crowds of heroes better than he does. The best example is the two-page splash of the two alternate Earth Legions arriving on the original Legion Earth. From this point on in the story, however, it's not going to be a picnic following who's with which Legion. Look at the three Brainiac 5s. Green skin, yellow hair, purple outfit. One adult. Two teens. Or the two Saturn Girls or two Element Lads. When the JLA and JSA visited each other's Earth in the pre-first "Crisis" days, most of the doppelgangers looked different enough (Earth-2 Superman has grey hair and a different "S") or were completely different people (Barry Allen was the Earth-1 Flash and Jay Garrick was the Earth-2 Flash - two different people who wore two very different looking costumes). Hopefully, we'll get a scorecard with issue three. 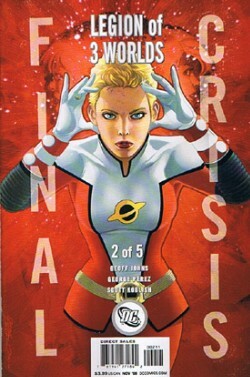 Cover Art (Saturn Girl) - 4: It's a beautiful rendition of Saturn Girl (notwithstanding the inappropriate placement of the DC Comics logo). But these single hero/heroine covers are a bit dull. If it's really a "Crisis" with a capital "C", I want a cover loaded up with characters. Especially when George Perez is doing the drawing. Cover Art (Séance) - 5: George Perez and tons of heroes in an homage to the cover of the first meeting of the Justice League of America of Earth-1 and the Justice Society of America of Earth-2 (Justice League of America, vol. 1, #21, 1963). Perfection. Well, almost perfection. I still don't buy it that the white marks on the "Final Crisis" covers are intentional to reflect the deconstruction of the DCU. 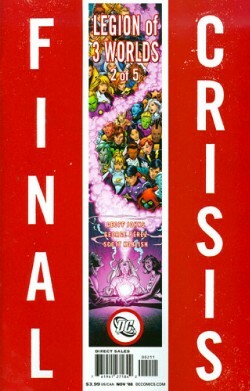 It was a good attempt at an excuse, DC, but, come on, hone up to the printing errors. Check out the Comic Index Lists for the complete list of Superman-related comics published in 2008.